Xiaomi Redmi 6, Redmi 6A Launched in China with 18:9 Display, Dual Cameras and Affordable Pricing - Playfuldroid! The Redmi 6 and 6A smartphones have metallic bodies. They feature 5.45-inch display that produces HD+ resolution of 720 x 1440 pixels. The Helio P22 chipset powers the Redmi 6 along with 3 GB of RAM. It comes in two storage choices of 32 GB and 64 GB. On the other sides, the all new Helio A22 powers the Redmi 6A with 2 GB of RAM. It has a native storage of 16 GB. Both the smartphones are equipped with a microSD card slot. The 6 and 6A phones are loaded wit Android 8.1 Oreo that is customized with latest MIUI that brings along features like AI face unlock, AI portrait shot, intelligent translation and AI voice assistant. The Redmi 6 has a rear-mounted fingerprint whereas the 6A phone does not feature it. The Redmi 6 has a 12-megapixel + 5-megapixel dual camera setup. The Redmi 6A has a single rear camera of 13-megapixel. Both phones have 5-megapixel front-facing camera. These devices are equipped with 3,000mAh batteries. 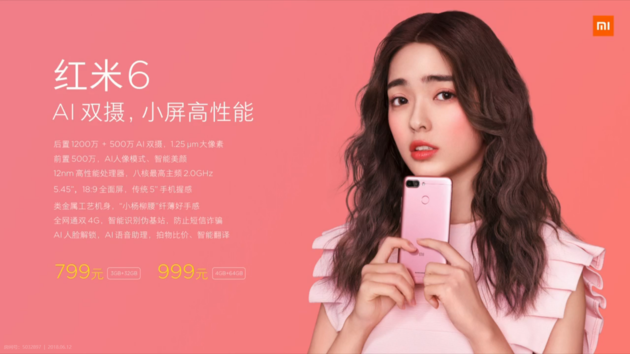 The 32 GB and 64 GB Redmi 6 models respectively cost 799 Yuan ($125) and 999 Yuan (~$156). The Redmi 6A is priced at 599 Yuan ($93). 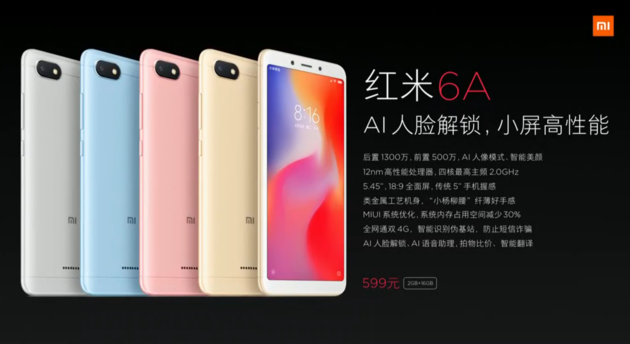 The Redmi 6 and 6A phones will be available for buying in the home country from June 15.